Bart van Lier, born on June 14, 1950 in Haarlem (the Netherlands), began playing the cornet in his local brass band at the age of 7. Two years later he changed to bugle and at the age of 13 he began private trumpet lessons. At the Hilversum Music Lyceum his course of study in 1965 (trumpet and violin als principle instruments) transformed into a trombone study one year later. In 1968 he began freelancing for the radio, TV, and commercial recording studios. Between 1969 and 1977 he was a member of the following ensembles: the “Tony Nolte TV Orchestra”, the “Netherlands Jazz Orchestra”, Rogier van Otterloo’s TV Orchestra for the program”Music All Inn”, “Boy’s Big Band”, and Slide Hampton’s 4trombone group. From 1977 he played in Cees Slinger’s “Just in Case”, the “ Frans Elsen Septett” (until 1979), the “Ramblers” (until 1980) , the “Skymasters” and today he still plays with the “Peter Herbholzheimer Big Band” and “Nueva Manteca”. Bart has been teaching at the Hilversum Conservatory from 1980 until 1998. He also was the trombone teacher at the Hague Conservatory from 1977-83 and 1991-94. He has a post at the Rotterdam Conservatory since 1998. The trombone “Model Bart van Lier” went into production by Fa. Kühnl and Hoyer in 1994. Meanwhile there are three different models under his name. The same year his technique book “Coordination Training Program for Trombone Playing” was published for the international market. It is available in 5 different languages. He was appointed permanent first trombonist and soloist of the Metropole Orchestra in 1992, and since 1990 his own groups “Bart’s Bones” and “Trio Bart van Lier” have been performing for the Nederland Impresariaat. In 1998 the “Bart van Lier- Ilja Reyngoud Quintet” was founded. 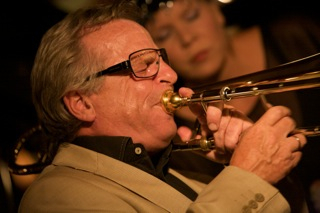 Over the years Bart has given Trombone workshops in Germany, Switzerland, the Netherlands, Norway, Spain, Hungary, the United Kingdom, India , Japan and the United States. Noteworthy recordings are “First Brass”(1985), Bart’s Bones (1991), his solo album with the Metropole Orchestra, “Twighlight”(1998) and the CD “Memories of the Future” from the Bart van Lier-Ilja Reyngoud Quintet (1999). New Solo Cd “Live At De Tor” and London Sessions with Benjamin Herman. “Untamed world” from Ilja Reijngoud, 7 trombones and rhythm section (2007). “Hiros” (2013), 9 classical trombones International Trombone Ensemble ITE with Bart van Lier as soloist. “High slide low blow” (2013) Jazzquintet.